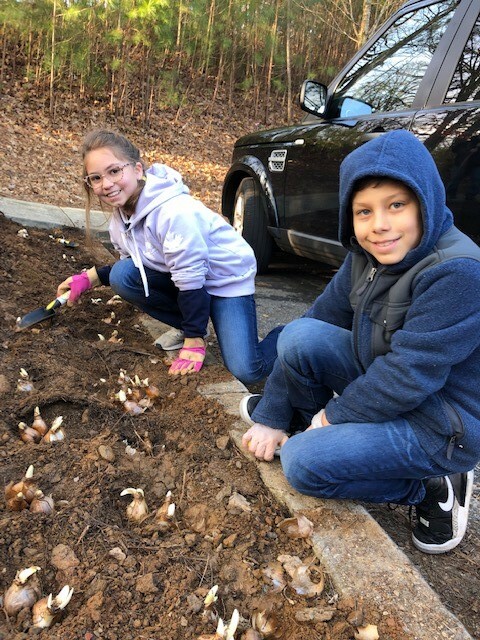 In January, fifth grade students planted a daffodil garden as part of the Daffodil Project. The goal of the Daffodil Project is to build a living Holocaust memorial by planting 1.5 million daffodils around the world to commemorate the 1.5 million children murdered during the Holocaust. The daffodil flower represents the yellow Star of David that Jews were forced to wear in public during the Holocaust, and the perennial nature of this flower inspires hope for the future and reminds us that life is eternal. The planting project at OLA is a culmination of a cross-curricular examination of the Holocaust. Students planted 500 daffodil bulbs in the planting bed near the parking lot exit. Visitors to the church and school can expect to enjoy the blooming daffodils in late February to early March.